Soil is the largest carbon (C) pool in the terrestrial biosphere and any change in its size may influence the atmospheric CO2 concentration and feed back to ongoing climate change. Most soil microorganisms utilize organic C as a source of energy and biosynthetic precursors, while releasing CO2 and contributing to long-term soil C storage. The regulation of energy (ATP, NADH, NADPH) production and consumption by intact soil microbial communities is not well-understood but fundamental to soil and therefore ecosystem C and N cycling. 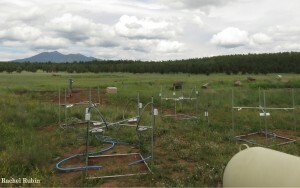 We studied the effects of temperature on soil community metabolic processes. Our results indicate that activity shifted from pentose phosphate pathway to glycolysis with higher temperature. 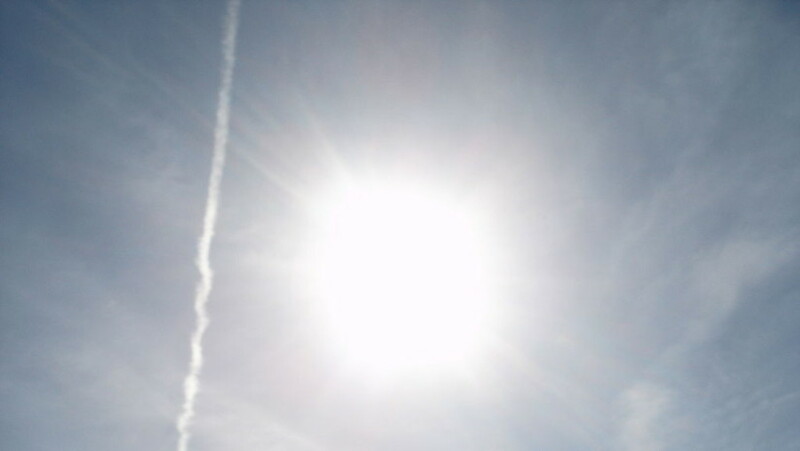 However, we observed only small alterations in estimated energy production. Dijkstra, P., Scott Thomas, Paul L. Heinrich, George W. Koch, Egbert Schwartz, Bruce A. Hungate. 2011. Effect of temperature on metabolic activity of intact microbial communities: evidence for altered metabolic pathway activity but not for increased maintenance respiration and reduced carbon use efficiency. Soil Biology & Biochemistry, 43:2023-2031. Extreme climate events, including heat waves and drought, disrupt ecosystems and are increasing in frequency and intensity. Although understudied, these events likely produce “legacy effects” that affect plant survival and recruitment long after the event has dissipated. 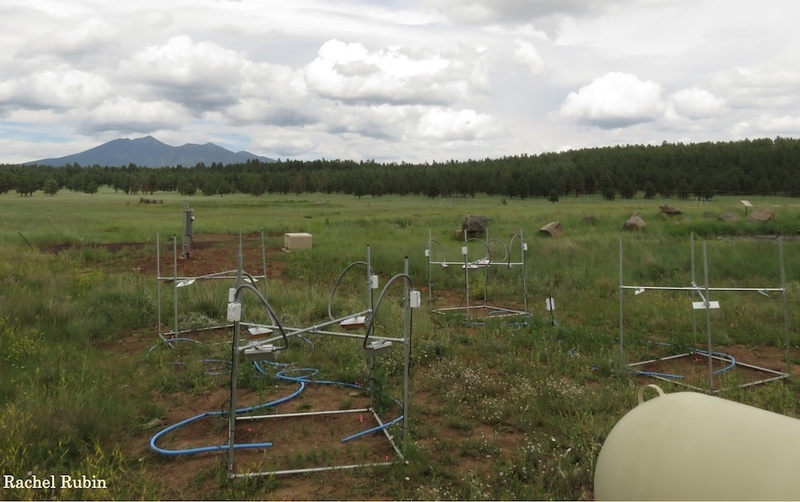 Working with the Southwestern Experimental Garden Array (SEGA) and the Flagstaff Arboretum, we have implemented a heating array to test the effects of short-term drought and heating on plant performance and microbial community dynamics. Additionally, we are examining whether microbial inoculants can be used to prime a native C4 grass, Bouteloua gracilis, for abiotic stress resistance in a restoration setting. This research will shed insight into the mechanisms that underlie extreme climate adaptation, as well as provide tools to promote ecosystem resilience. 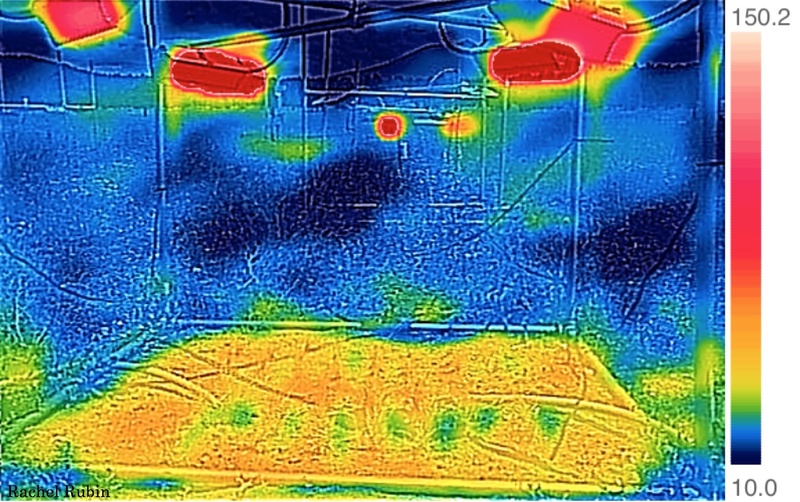 Infrared image of a heated plot. Hot lamps are reddest. Please consider a charitable gift to the Center for Ecosystem Science and Society this year. Scientific research in the service of society can enhance quality of life and pique human curiosity. Generous support from the university and grants from federal agencies cover only a part of our work, so your gift is an essential contribution. Gifts can be designated for student research, providing opportunities for undergraduate students to work with Ecoss scientists on cutting edge ecosystem research. Research teaches independence and instills a lifelong passion for knowledge. Click "Support Us" at the top of the page. Jackson CR, Stone BWG (2019) Canopy position is a stronger determinant of bacterial community composition and diversity than environmental disturbance in the phyllosphere. FEMS Microbology Ecology 95(4): fiz032. The effect of rain on the phyllosphere community has not been extensively explored, especially in the context of spatial variation on the impact of rain throughout the tree canopy. We characterized the response of the phyllosphere bacterial community removed from leaf surfaces of the Southern Magnolia (Magnolia grandiflora) to rain across different spatial locations of the canopy. We hypothesized that: (1) rain would lead to an initial decrease in phyllosphere bacterial diversity, followed by an increase in diversity on subsequent days, but that this effect would be minimized in the lower and interior portion of the canopy, and that (2) community beta dispersion of phyllosphere microorganisms would be lower following rain, and similarly contingent on canopy position. We used targeted next-generation sequencing of the V4 region of the bacterial 16S rRNA gene to characterize bacterial composition. We found higher bacterial richness in interior canopy and distinct composition across canopy positions. Further, the effect of rain on beta dispersion was contingent on canopy position: rain lowered dispersion in the upper canopy but increased it in the lower and interior canopy. Our results demonstrate that canopy structure should be considered when looking at the impact of rain on the collective phyllosphere community. Yang W, Jeelani N, Zhu Z, Luo Y, Cheng X, An S (2019) Alterations in soil bacterial community in relation to Spartina alterniflora Loisel. invasion chronosequence in the eastern Chinese coastal wetlands. Applied Soil Ecology 135: 38-43. 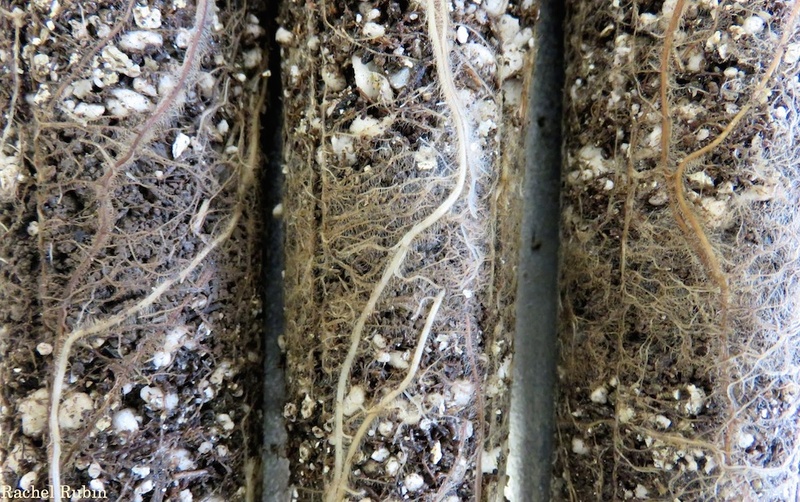 In order to better understand the variations in soil bacterial community and associated drivers following plant invasion, we investigated changes in soil bacterial community along with 9-, 13-, 20- and 23-year-old Spartina alterniflora Loisel. (SA) invasion in comparison with bare flat (BF) in the eastern Chinese coastal wetlands, based on analyses of quantitative polymerase chain reaction (qPCR) and Illumina MiSeq DNA sequencing of 16S rRNA gene. The SA invasion significantly elevated soil bacterial abundance and diversity relative to BF, with the highest levels in 9-year-old SA soil, which gradually decreased with SA invasion from 9 to 23 years. The abundance of copiotrophic Proteobacteria, β-proteobacteria, and Bacteroidetes generally diminished along with SA invasion chronosequence. While, changes in abundance of oligotrophic Chloroflexi, Acidobacteria, Nitrospirae and Planctomycetes exhibited opposite trends. Our data suggest that soil nutrient substrates, and physiochemical properties (soil pH and/or moisture) primarily drive the shifts in soil bacterial abundance, diversity, and community composition along with SA invasion chronosequence in the costal wetlands of eastern China. Overall, soil bacterial abundance and diversity peaked in 9-year-old SA community, with soil bacterial community composition changing from copiotrophic to oligotrophic groups along with SA invasion chronosequence. Yan Q, Dong F, Yang F, Lu J, Li F, Zhang J, Dong J, Li J (2019) Improved yield and water storage of the wheat-maize rotation system due to double-blank row mulching during the wheat stage. Agricultural Water Management 213: 903-912. Mulching techniques have been widely used in dryland regions in northern China. 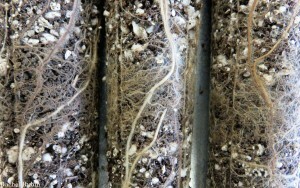 It is necessary to develop water-saving cultivation techniques in irrigation regions in northern China to relieve water scarcity. Planting and mulching on separate rows has been widely used to improve wheat yield and involves a pattern of a double row of planting and a blank row of mulching. However, whether the mulching pattern during the wheat season can be applied to the wheat-maize system to increase the yield of both crops and to reduce the use of irrigation water remains unclear. Three mulching practices (conventional planting (CP), conventional planting with mulching (CPM) and double-blank planting with mulching (DPM)) during the wheat season were conducted to verify the potential roles of DPM in increasing wheat and maize yields, improving soil temperature and enhancing water storage under the DPM practice. The results show that the DPM practice significantly increased the efficiency spike number, aboveground biomass and grain yield (7.8% higher than CP and 11.3% higher than CPM) of wheat. The heat conservation effect of the DPM practice was stronger in the early stage of growth and was more effective in minimizing fluctuations in soil temperature in the wheat season compared with CPM. The development and yield of maize that was sowed in the mulching lines of DPM were less improved, although the amount of aboveground biomass at the maturity stage was higher. Additionally, the soil temperature of the maize season under DPM showed a narrowing trend of changes during the early stage with slight effects in the middle stage and a resumption of heat conservation in the late stage. Compared with CP, both mulching patterns decreased soil evaporation during the two crops’ seasons by an average 5.3% in CPM and 7.8% in DPM, which is particularly evident when the crops’ leaf area index was low. 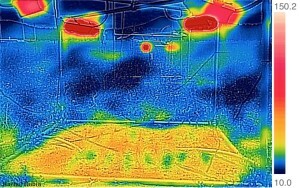 Therefore, the DPM pattern could more effectively optimize soil temperature and water storage. Furthermore, this pattern may have positive effects on the yields of winter wheat and on reducing the soil water requirement of the maize season.